Nathan Chan (born 1993) is a Chinese-American cellist from Hillsborough, CA. He has performed with the San Francisco Symphony, The Royal Philharmonic Orchestra, and the Albany Symphony Orchestra, among others, and was featured in the HBO Show, "The Music in Me: Children's Recitals From Classical to Latin to Jazz to Zydeco" as well as Channel 4's "The World's Greatest Musical Prodigies". He graduated from Columbia University in 2014 as a student of the Columbia-Juilliard Exchange with a Bachelor's degree in Economics, and from The Juilliard School with a Master of Music degree. Nathan Chan was born in San Mateo, CA to a musical family. His parents, Samuel Chan and Rena Ling, both play instruments, and his mother is a pianist and alumnus of the Juilliard School. His sister, J. Clara Chan, is a violist in the Barnard College Manhattan School of Music Exchange Program. Chan began his musical career as a conductor at the age of three. Herbert von Karajan, Leonard Bernstein and Seiji Ozawa were some of his biggest inspirers and heroes. His talent attracted the attention of San Francisco Opera assistant conductor Sara Jobin, who helped Chan make his debut as a conductor at age three, leading the San Jose Chamber Orchestra in a set of Mozart variations. Chan has soloed with orchestras including the San Francisco Symphony, San Francisco Chamber Orchestra, the Royal Philharmonic, the UK Northern Sinfonia, Albany Symphony Orchestra, Marin Symphony, Hong Kong Chamber Orchestra, and The Juilliard Orchestra. Chan has also made many appearances on public radio and TV including NPR’s From The Top, NPR’s Performance Today with Fred Child, and HBO’s "The Music in Me: Children's Recitals From Classical to Latin to Jazz to Zydeco". These collaborations attracted the attention of singer Roberta Flack, who asked Chan to record for her Beatles tribute album, "Let It Be Roberta". In 2009, he was featured in a British documentary entitled "The World’s Greatest Musical Prodigies". Chan has premiered works including the Velesslavista Quadruple Concerto, composed by Alexander Prior, and Double Concerto for Clarinet and Cello, composed by Jonathan Russell. Chan is also a co-founder of the cello ensemble String Theory at Columbia University, with whom he traveled to Arizona to perform at Google’s 2013 Zeitgeist conference. Chan recently began employment with the Seattle Symphony. Chan went to Crocker Middle School in Hillsborough, CA, where he joined the band and learned to play the alto saxophone. He later attended Lick-Wilmerding High School in San Francisco, CA. At this time, he began his studies with San Francisco Conservatory teacher Sieun Lin. Chan attended Columbia University as a student of the Columbia-Juilliard Exchange Program, where he studied with Richard Aaron. Chan was also part of the Hong Kong Students and Scholars Society while he attended Columbia University to celebrate his roots in Hong Kong culture. Chan was the winner of the 2013 Juilliard Cello Concerto Competition playing the work Don Quixote by Richard Strauss. Nathan is the recipient of the 2012 Davidson Fellowship for his work, "The Importance of Passion". Nathan Chan is a strong advocate of using music as a way to inspire others. To make music more popular, he has used YouTube as a way to promote himself and his music. As of May 2014, he has more than 3.5 million views on his videos. Chan has also made music videos that combine both classical and pop genres of music in order to attract a wider audience. Chan's playing style is said to be emotive, passionate and youthful. Chan plays on a 2006 Joseph Grubaugh and Sigrun Seifert cello made in Petaluma, CA. He previously played a 7/8ths cello made in 1756 by Domenico Busan. ^ Shattuck, Kathryn (October 7, 2006). "Big Sounds, All but Bursting Out of Small Packages". The New York Times. ^ "The World's Greatest Musical Prodigies". Channel 4. Retrieved 2014-06-08. ^ Ostertag, Emily (2012-09-18). 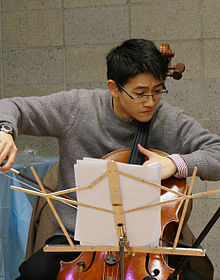 "Cellist Chan plays his way to $25k fellowship". Columbia Daily Spectator. Retrieved 2014-06-08. ^ Peninsula's "Fountain of Youth"
^ Shelah Moody (2007-09-14). "Young cello prodigy ventures into pop music with Roberta Flack". San Francisco Chronicle. Retrieved 2014-06-08. ^ Yang, Helen (2013-09-10). "Cello group String Theory to hit Google Zeitgeist stage this week". Columbia Daily Spectator. Retrieved 2014-06-08. ^ Payne, Jenny (2013-04-18). "Chan wins Juilliard competition". Columbia Daily Spectator. Retrieved 2014-06-08.